Small, light and rugged – this could be a short requirement specification for the connection systems needed for the various “Soldier Modernisation” programmes. As in many other branches, this area is creating a great challenge for connector manufacturers, because even these compact connectors must ensure reliable power transmission and EMC protection and satisfy many additional requirements. 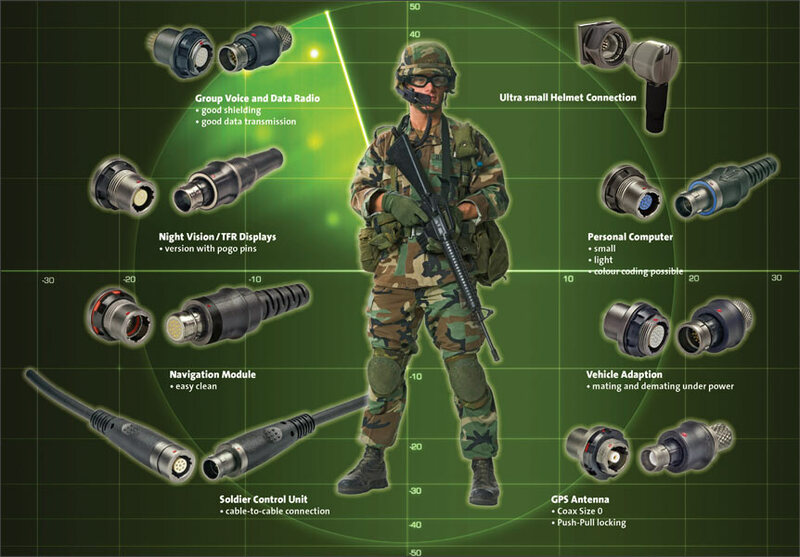 Globally, there are some 40,000 connectors in use in the military and security engineering sector, and while all have their advantages, they are not suitable for all the requirements that will have to be met in this area in the future. Equipment manufacturers must build smaller and lighter, and this naturally means compact and light connectors. The right information at the right place and the right time can mean the difference between life and death. As a rule, connectors are responsible for transmitting this information, which is why no compromises should be accepted in the quality. The new ODU AMC (Advanced Military Connector) connector series satisfies all customer requirements related to weight, ruggedness, leak tightness, data transmission and many other areas. This is not just a single connector – it is a complete connector series in different sizes and designs. This product variety allows system developers in “Soldier Modernisation” programmes to access one supplier and consequently a complete solution that is always compatible. The company has standard connectors, receptacles and cable parts with reliable push-pull locking or break-away function. These can be mixed and matched, meaning the push-pull and the break-away connectors can be plugged into the same receptacles and cable parts. A major advantage is the interchangeability, which allows the cable sets to be exchanged later without problems, because there is no need to exchange the receptacles. The decision on push-pull or break-away function depends on the application area. If the connection will never be taken apart, the reliable push-pull locking is the right choice. If it will be necessary to separate the connection as quickly as possible in case of emergency, the break-away function is the recommended solution. Six sizes with up to 55 contact positions are available as standard. The connection system has been equipped with mechanical and colour coding as an extra safety option. The special feature here is that the colour coding is only visible when the connector is not plugged in. The combination of colour and mechanical coding makes incorrect plugging practically impossible. The company has also included an “Easy-to-Clean” version as a standard in the product portfolio. The inserted spring loaded contacts allow rapid and easy cleaning of the connector in the field. Dust, dirt and mud cannot harm this connector. The customer can also choose from various sizes and contact arrangements here. The Easy-to-Clean version is likewise equipped with mechanical coding options. 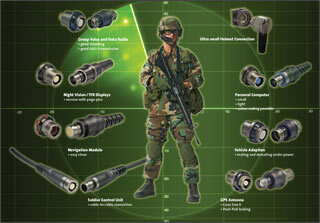 Communications demands 360° EMC protection. It is vital that no outside influences can disrupt communication between the soldiers and the control centre. The ODU AMC series naturally has the right solution here, as well. All versions have been designed with 360° shielding, which is provided by shield casings, ground caps, crimping or shielding tape. Data transmission also naturally plays a very important role in the military sector. Data must be transmitted in the shortest time possible, and most importantly, in good quality. Various inserts that can be built into the ODU AMC connectors are available for this. USB + Ethernet in one connector, Ethernet for up to 1 Gbit/s or E-Sata – such connectors ensure that soldiers have the best equipment for problem-free communication in the field. Several special requirements have already been implemented within the ODU AMC series. For example, an extremely short, angled connector has been developed especially for the connection to the helmet. And special contacts and contact inserts have been developed for the “hot-plugging” area. The right connector is available to satisfy the particular customer requirements. As a system supplier, ODU offers more than just the connection systems alone. The company also offers its customers complete assembly, including cable and extrusion. As a result, ODU’s customers have a complete system from a single source. One question often heard in the area of cabling is, “What about wireless?” This is a reasonable question, but this area is currently not under consideration. The risk of a system breakdown is simply too high, and naturally this is a risk that no one wants to take. And it would be necessary to integrate additional transmitters into the equipment, which would only further increase the weight of the soldier’s equipment. Since its founding in 1942, connector specialist ODU from Mühldorf in Germany has been developing and manufacturing connection systems for military technology. Well-known companies throughout the world put their trust in the quality of ODU products. These products are used, for example, in different communication systems, night-vision devices, radio, radar and sonar systems, submarines, weapon systems, battleships, tanks, anti-missile systems, and many other areas. ODU is home to all the technologies needed for manufacturing these connectors: design & development, in-house tool manufacturing, stamping, injection, surface coating, turning, assembly automation and cable assembly. The high level of vertical integration allows ODU to react swiftly and flexibly to its customers’ wishes. ODU connectors are certified to ISO 9001, VDE, UL, CSA, VG, MIL, ISO TS 16949.